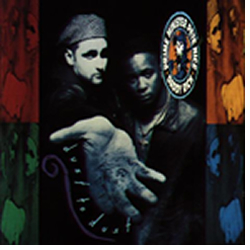 The Cactus CD was the major commercial debut by MC Serch and Prime Minister Pete Nice along with Daddy Rich and production from the likes of The Bomb Squad, Prince Paul and Sam Sever. In 1989 3rd Bass made their mark on the world of hip hop. So far the only white MC’s that had really made it mainstream yet were the Beastie Boys, also released on Def Jam. Pete and Serch were a little different than the Beasties though, while although having fun on the mic they kicked it with a little more of a serious tone. 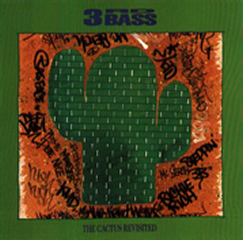 In fact on the second track of the Cactus Album 3rd Bass rips into the Beastie Boys citing that they have no talent and that the only reason they got anywhere was because of who they were and not of their abilities. The Beastie Boys are still going strong these days and even Serch has said that he respects the contributions that they’ve made to hip hop. The Cactus Album produced quite a few different singles. The Gas Face video looked like a who’s who of hip hop with legends like DMC and Flavor Flav. The Cactus also produced a video, or as they called it, a Vidie-Yo. This too short VHS tape contains three full length videos and two partial videos. That’s way too short for any 3rd Bass fan. What do you get when you take some of the hottest tracks from The Cactus Album, give them to some of the hottest producers of the time and let them have some fun in the studio? You get the Cactus Revisited. The Cactus Revisited was basically a remix album to keep all of the 3rd Bass fans at bay as we waited for Derelicts of Dialect to drop in 1991. Although there really wasn’t anything that extremely changed here, it was a nice collection of updated music to the songs we already loved, although The Gas Face and Product of the Environment did get a little lyrical facelift as well. 3 Strikes 5000 was also included on this album as the new track, and was also included on the Derelict’s album which made it’s novelty factor wear off rather quickly although the instrumental varies slightly. 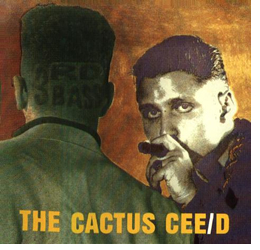 The Cactus Revisited, even though a remix album, belongs in the collection of any true 3rd Bass fan. The third and final effort by 3rd Bass was a great one. Although probably best known for the single Pop Goes the Weasel, Derelicts was filled with so many more gems such as the title track, Word to the Third and Portrait of the Artist as a Hood to mention a few. 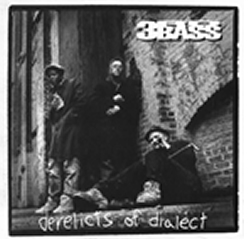 3rd Bass came back strong in 1991 with their second full length album “Derelicts of Dialect”. There was a slightly different flavor to the album as compared to the Cactus Album, but there were many strong points. MC Serch was the first of the now disbanded 3rd Bass-men to release a solo album. The release showed every 3rd Bass fan that Serch could still be the baddest white boy to ever touch a mic although most fans still felt it a little lacking without Pete to swap lyrics with. 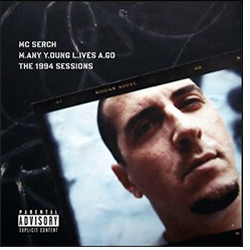 In 1991 MC Serch decided to go solo. One of the main reasons he left 3rd Bass was to spend more time with his family. “The day I married my wife was also the last day that 3rd Bass was together” Serch says. 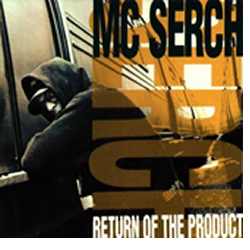 After separating from his 3rd Bass counterparts Prime Minister Pete Nice and Daddy Rich, Serch decided he still had something left in him to say and in 1992 he released Return of the Product. Return of the Product produced two pop sounding singles in Here it Comes and Back to the Grill, but anyone who listened to the album knows that this was no pop album. In fact this was probably MC Serch’s best social commentary that he ever put on a mic. In total there were three singles released from Return of the Product. With the release of Dust to Dust in 1993, it would prove to be the last commercial release for 3rd Bass fans. Unfortunately neither Serch or Pete released any follow up albums to their debut solo albums and even though there was a brief regroup, a reunion album never took place. Although it was a great CD for hip hop fans and 3rd Bass fans, it still wasn’t as great as 3rd Bass was. To those who still care to read the thoughts of the artist: My greetings to all of you. I hope these words find you in good health and spirits. I feel like I have a lot to explain and not a lot of space to do it in, as you can easily run out of space on the pages of a CD. It would take the space of a book to explain the story and the thought process behind this album, as well as, the last 3rd Bass project. I can tell you the reason for the name M.any Y.oung L.ives A.go, is to pay tribute to a dear friend who was, without question, my number one fan. She was an amazing young lady from Atlanta who looked out for me professionally, as a buyer for Tower Record’s urban dept. Her name was Myla Wyndam. She was a person who loved hip hop so much so, that after she left the music business, she remained a persona within the Atlanta music culture. DJ Jay Cee, (the current DJ for Disturbing the Peace) performed an on-air radio tribute during her almost four mile long funeral procession. Because of his knowledge of her love for MC Serch and 3rd Bass, he played our music for most of that time. Myla knew she was going to die, and she told Jay Cee that this was what she wanted to “hear” on the way to her final resting place. She had tried to call me two weeks before she passed, and I, not knowing she was even sick, didn’t take her call right away and instead planned to holla at my old friend later in the week. I never got to holla. I never got to say goodbye. I never got to tell her how much her friendship meant to me. I miss her and visit her grave site every time I am in Atlanta. Rico Wade would come with me on occasion and read psalms from his bible. I would sit on the grass and cry. I remember letting Myla hear these songs and she was confused by their direction. She thought the concepts were scattered and not focused. She was right. I was not focused. I was a young man who was evolving, not really sure where I should be going. I started to write these songs when I first partnered with DJ Eclipse. I had met Eclipse while on promo tour in South Carolina. I went the record store that he worked at and he threw on my first single that I had released in 1986 (That song was called “Melissa” on Warlock Records). We went outside and he started playing me beats and I was blown away. I told him to move up to NY and live with me and Chantel and we could work on music. He became my right hand man, and we toured the last leg of my solo album together. He DJ’ed for me on the Arsenio Hall show. We built a pre-production studio in my upstairs attic and started banging out beats. Eclipse had a great ear for finding samples that spoke to the sound of the moment. It was not the sound of the streets mind you, but the feel of the moment. That was what I got hooked into. Feeling for that moment. When was stressed out, he would find a beat that would plug into that energy, like “WHAT”. When we lost DJ Subroc, I wanted to do a song to capture that feeling when I remember him; he came up with “You Never Know”. He was and still is that guy; knowing when and how to plug into an emotion and bring it out of you. We brought in DJ Riz, known now for his famous Krooklyn Klan Party records and breaks with Fat Man Scoop, because he was my favorite type of DJ. Playful and wickedly skilled in tricks and cuts. If I felt it and could say it he could scratch it. I love scratching. Real scratching, not just rubs and buffs over snare snaps and horns, Scratches that speak the language of the culture. Scratches that mature and blend like a guitar riff and a sax solo. He would be quick to do it over and quick with a joke to lighten up a session. He is a tremendous person and a talented producer. I delivered the tracks to Russell. In the meantime Serchlite Music was getting ready to put out Nas’ classic “Illmatic” on Columbia. I would go to see my partner Mark Pearson and he would play me joints from the Nas sessions. Mark and I knew that Nas was going to change the game. And with my album, I just wanted to stay in the game. Nas’ record sounded so different from mine. I was not trying to compete with him, just wanted my album to stand for quality and not compete with Nas’ album. OC was in the studio as well, working on his demo that we were getting ready to shop. Mike D: “So, how is Serch nowadays”? Russell: “He is working on his record. I don’t know about it. Sounds real New York. If he doesn’t get back with Pete I am going to tell him to keep it”. WORD?!? How you gonna put that out in print and not talk to me about it first. That was real nervous on Russell’s part. I called him on it and he told me he needed to speak to me. I went to his apartment and he told me unless I delivered a 3rd Bass album that I was no longer an artist on Def Jam. I told him to go F&*K himself and walked out. I had given him 5 years of loyalty and he returned the love by letting me know in a magazine that I was being dropped. That was not fresh….not by a long shot. With Nas’ project in the can and ready to drop, and with OC needing to find a label, I needed to find a way to hold down the fort. There would be no advance from Def Jam and I had a child on the way. I was approached by Stu Fine about becoming a VP at Wild Pitch. I remember having dinner with Stu and playing him my music. He looked at me and said, “You’re not ready to be an executive yet, are you”. I should have said no. But I thought about Eclipse who moved up here to make music and OC who needed a home for his record. Riz was doing radio and had a club jumping off and was doing records with AV8 so I was not worried about him. I realized that I could look out for everyone if I was running a label. I told Stu we needed to sign OC and wanted Eclipse to do Retail, which he already knew from doing it in South Carolina. He agreed and we moved on. I never looked back and that includes these masters. Never thought about them and did not know where they were and did not care. I was putting that behind me. I was moving on to the next phase of my life. My first child, a daughter, was born the week after Illmatic came out and OC’s album “Word…Life” came out 6 months later. We had two classics on our hands out the gate. There was no room for my music. I worked with some great artists between then and now. Eclipse and Sabac (who was also hooking up a demo and was a dear friend) and I hooked up with Ill Bill and Gortex and formed Non Phixion. It would be the last group I would get involved in. Besides some freestyles here and there I was no longer concerned with putting out music. I was not going to burden music with feeding my family. I love music too much for that. I figured out I could do other things. And other things I did. I moved to Detroit in 2002 to pursue a career in radio. I sold the only home that my family had ever known and came to the D. 530 boxes came with me. The guy who moved me had worked for the moving company for a lot of years, in the double digits, as I recall. He said he never moved so many boxes in his career. I was gone. I always jump in with two feet. I never test the water. A gift and a curse. Many of those 530 boxes went to a climate controlled storage center in Southfield, MI. Four years later, I decided it was time to see what was in storage. I found the tapes. I found a 25 year old MC trapped in a box. It was time to let him out. Beyond the digitizing of these master reels, some of which had to be baked due to the deterioration of the reels, there was the pure listening to the tracks, each one being laid out to be captured by a hard drive and a pro tools session. I began to become very fascinated with what I was saying. With my flow and the words I was accentuating. It was a wonderful experience to mix these songs finally with a great mixer, DJ Marc Allen in his lab in Ann Arbor, MI. It was 6 months of tweaking and fine tuning. I have told about 30,000 people at one point or another, from my page on My Space to www.serchlitemusic.com, to look out for these tracks coming soon. Some of those people no longer believe that these tracks were really coming. Most of you did and do. When people ask me what do I want people to get out of hearing these songs I give them an honest answer. I hope it takes you back to 1994. A time when Jazz was still an important part of hip Hop. When sampling was still an integral part of the soundscape of the culture. When lyrics were about being lock’ed down and a MC could breathe free. When scratching was pleasurable to hear on a track. When the MC was moving you with not just energy but with a message. Don’t get me wrong, these are still elements of what is going on in Hip Hop music today, but it’s not like it was back then. This is not about competing, but for me it is about completing. I can move forward. Whether it is on TV, with my show on VH1 called Ego Trips; The White Rapper show, or running Serchlite Music with my Partner CC. My wife and I are still together and my oldest daughter that was conceived during this original recording process now has a brother and a sister to keep her company. I hope that this music can keep you company. Especially when you need to get back…Get back to Many Young Lives Ago. PS: The bonus songs from 3rd Bass – “Cats in the Cradle” and “Out the Back” were recorded in 2000 when Pete and I tried the last time to put together a 3rd Bass album, titled “Icabod’s Cranium”. In the end it was just not our time anymore. Pete was on to other things and I was running Serchlite. We could not get up enough to make a record. I know I don’t have to say it, but I apologize to you, the fans that have held the flame for us. We wanted to make that album for you and we could not get our schedules together to make it happen. I am sorry I waited so long. I am sorry for not making it more of a priority. But that is the way life works. I wish to thank my wife Chantel for putting up with me for 18 years. I thank my children Maya, Myles, and Mia for being inspirations everyday.